The Cardinals added another name to their offensive coordinator search today, interviewing former Browns coach Hue Jackson, according to Ian Rapoport of NFL Network (Twitter link). 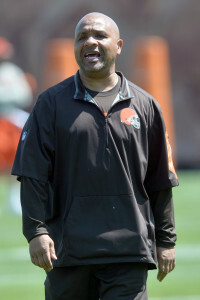 After being fired from the Browns mid-season, Jackson took a job on Marvin Lewis’ staff in Cincinnati, where he had previously served as offensive coordinator. Jackson received an interview for the Bengals’ head coaching gig after they fired Lewis, but the job ended up going to Rams quarterbacks coach Zac Taylor. If Jackson does get the job, it would reunite him with Vance Joseph, who recently signed on to be Arizona’s defensive coordinator. Jackson and Joseph worked together for two years in Cincinnati, and together they’d provide a lot of head coaching experience for new Cardinals coach Kliff Kingsbury to lean on. Jackson received a ton of criticism toward the end of his Browns tenure, but was a highly respected offensive mind and coordinator before that. All the losing the Browns did is what most remember Jackson for now, but he was a hot head coaching candidate before he took the job in Cleveland. He was rumored to be a candidate to be the Vikings’ offensive coordinator, but they opted to stay in-house with Kevin Stefanski instead. It was reported last week that Steve Sarkisian was close to joining Kingsbury’s staff as offensive coordinator, but that fell apart when Sark decided to return to Alabama instead. Arizona has been taking their time, and interviewed former Packers offensive coordinator Tom Clements a couple of days ago. They’ve also been linked to former Giants coach Ben McAdoo and former Lions offensive coordinator Jim Bob Cooter. Judging by the candidates they’ve been interviewing and the earlier hire of Joseph, it seems like the Cardinals are intent on surrounding Kingsbury with a ton of high level NFL experience as he prepares for his first ever coaching gig in the pros. The Cardinals play the Browns next year, so if Jackson gets hired it would be another opportunity for some great Baker Mayfield/Jackson viral moments. In announcing Greg Roman as their new offensive coordinator, the Ravens also disclosed previous OC Marty Mornhinweg will not be returning to Baltimore in 2019. Mornhinweg, who’d been with the Ravens since 2015 and calling plays since 2016, rejected the opportunity to take another position on Baltimore’s staff. “We tried to keep Marty, but he has decided to move on, and I respect that,” head coach John Harbaugh said. “He’s a really good coach and helped us win the AFC North last season and get close to the playoffs the previous two years.” Roman had reportedly drawn OC interest from the Dolphins, which could have played a factor in his promotion from assistant head coach/tight ends. Hue Jackson will not return to the Bengals‘ staff under presumptive new head coach Zac Taylor, Elise Jesse of WLWT was the first to report (via Twitter). Jackson, who is close friends with former Bengals head coach Marvin Lewis, was hired by Cincinnati at midseason, shortly after being fired as Cleveland’s head coach. 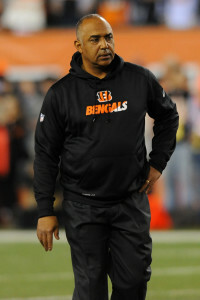 Although he interviewed to succeed Lewis, Jackson was considered likely to leave the Bengals’ staff if he didn’t land the top job. While he could be in contention for offensive coordinator jobs, Jackson might have to spend 2019 as a position coach. Former Seahawks offensive coordinator Darrell Bevell is in consideration for the same role with the Bengals, according to Albert Breer of TheMMQB.com (Twitter link). Bevell is reportedly “high on [Taylor’s] list” of possible OCs, as the rookie head coach is looking for someone with plenty of experience. The 49-year-old Bevell has interviewed for play-calling openings in both Jacksonville and Atlanta this year, but thus far hasn’t landed a job after being out of the NFL in 2018. Meanwhile, ex-Giants head coach Ben McAdoo — who recently met with the Cardinals — is a “name to watch” in Cincinnati, per Ian Rapoport of NFL.com (video link). The Browns have interviewed Utah offensive line coach Jim Harding for the same position, tweets Tom Pelissero of NFL.com. Harding, who was previously Utah’s co-offensive coordinator from 2015-15, is considered one of the best OL coaches at the collegiate level, per Pelissero. He interviewed with the Bengals in 2018 before Cincinnati hired Frank Pollack. Although previous reports had indicated Hue Jackson was a “real possibility” to fill the Vikings’ vacant offensive coordinator position, Jackson is unlikely to land in Minnesota, according to Chris Mortensen of ESPN.com (Twitter link). While Jackson may not be the choice, the Vikings are expected to have a new offensive play-caller in place “soon,” per Mortensen. Minnesota is presumably still considering incumbent Kevin Stefanski, who was installed as OC for the club’s final three games following the firing of John DeFilippo. Stefanski, whose contract with the Vikings expires on Tuesday, has interviewed for the Browns’ head coaching job. Jackson, of course, hasn’t posted any success as a head coach (as his 11-44-1 overall record indicates), but he’s been relatively competent as an offensive coordinator in the past. While his work as a dual head coach/OC with the Browns was ineffective, Jackson did lead the Bengals to a No. 2 ranking in offensive DVOA in 2015, his last season as solely an offensive play-caller. Jackson, who joined the Bengals after being fired the Browns and has subsequently interviewed for Cincinnati’s open head coaching gig, would have offered familiarity with Vikings head coach Mike Zimmer, as the overlapped in the Queen City from 2012-15. Mike McCarthy is looking to stay close to his two high-school aged stepchildren in Green Bay, Rob Demovsky of ESPN.com tweets. That would explain why McCarthy is looking into opportunities with the Browns and Jets and is potentially not interested in further destinations such as the Cardinals. McCarthy’s interview with the Browns has been rescheduled for next week, according to Rob Demovsky of ESPN.com (on Twitter). Adam Gase‘s interview with the Jets will take place on Friday, according to Ian Rapoport of NFL.com (on Twitter). Hue Jackson to the Vikings is becoming more of a real possibility, according to Ben Goessling of the Star Tribune (on Twitter). According to sources, head coach Mike Zimmer could try to hire him if Jackson doesn’t get the Bengals’ head coaching job. Ultimately, however, it will come down to what GM Rick Spielman thinks of Jackson as a candidate. 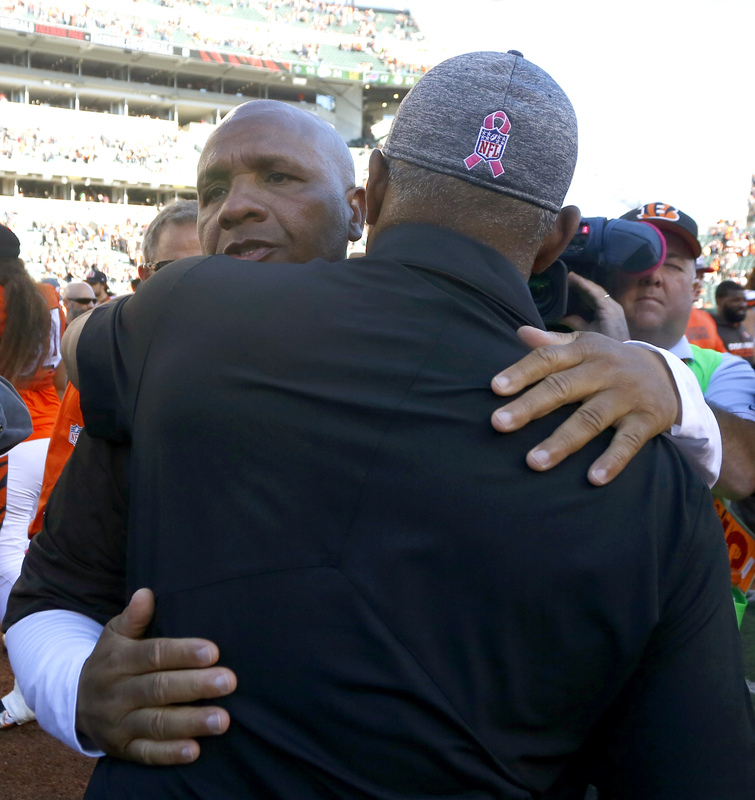 Could Hue Jackson return to the head coaching ranks? The Bengals are at least interested in hearing him out and could interview him as early as Wednesday, according to Ian Rapoport of NFL.com (on Twitter). The Bengals have a long history with Jackson and quickly scooped him up after he was fired by the Browns in 2018. Jackson has the support of longtime former head coach Marvin Lewis, which likely helped him secure a head coaching interview with the Bengals. The Bengals have already interviewed in-house candidates Darrin Simmons and Bill Lazor for the gig, so they’re doing their homework internally before casting a wide net elsewhere. Old friend Vance Joseph will have a two-day chat with the Bengals this week and a meeting with Chiefs offensive coordinator Eric Bieniemy is on tap for Friday. Patriots offensive coordinator Josh McDaniels and Rams assistant Zac Taylor are also among the names in the mix. We heard last night that the Packers are interested in Northwestern head coach Pat Fitzgerald, and now there is some fire for that smoke, as Adam Schefter of ESPN.com reports that Green Bay is expected to request an interview with Fitzgerald after Northwestern plays in tomorrow’s Holiday Bowl. It is unclear whether Fitzgerald will accept the interview request, but Packers CEO and president Mark Murphy was Northwestern’s athletic director when Fitzgerald was hired as the Wildcats’ head coach in 2006, and the two men have a great deal of respect for each other. Schefter reports that at least one team that is considering a head coaching change is also considering calling the Ravens about a potential trade for head coach John Harbaugh if Baltimore is eliminated from postseason contention today, and Jay Glazer of FOX Sports (via Mike Florio of Pro Football Talk) says multiple teams are thinking about making a run at the 11th-year HC. The Ravens announced earlier this month, despite weeks of rumors to the contrary, that Harbaugh would remain in Baltimore in 2019, but his future with the club still does not feel like a slam dunk. Florio suggests that Baltimore would want at least two first-round picks in exchange for Harbaugh. No one is sure what will happen with Marvin Lewis and the Bengals, and his assistant coaches are actively trying to find out, per Florio. Some believe Lewis will retire from coaching and begin a broadcasting career, while others believe he could become a candidate for the Cardinals‘ head coaching job. If Lewis moves on, Florio writes — as has been reported numerous times — that Hue Jackson would be a candidate to replace him, as would current Vikings head coach (and former Cincinnati DC) Mike Zimmer. Zimmer would perhaps be interested in the Bengals’ gig, per Florio, but much would depend on whether Minnesota would let him leave and if the Vikings would demand significant compensation in exchange. The Vikings will likely attempt to promote interim OC Kevin Stefanski to the full-time job in 2019, per Ian Rapoport of NFL.com. The problem is that Stefanski is only under contract through 2018, so Minnesota may have to fight to retain him. We heard several weeks ago that Browns interim head coach Gregg Williams has a chance to get the “interim” tag removed, and Jason La Canfora of CBS Sports reports that Cleveland will indeed give Williams serious consideration (though the team will obviously interview other candidates and continue its full-blown search). Ownership remains high on Patriots OC Josh McDaniels, but if the team does not give Williams the full-time job, it will risk losing the bulk of the staff that has led the Browns’ promising turnaround this year. Lions OC Jim Bob Cooter‘s contract is up at the end of the season, per Rapoport, who suggests that it would be a surprise if Cooter remained in Detroit in 2019. The 34-year-old is expected to be a highly-coveted OC candidate assuming he and the Lions part ways. Unsurprisingly, Rapoport says head coach Matt Patricia is safe [SOURCE LINK]. Bengals head coach Marvin Lewis, now in his 16th year at the helm, appeared all but gone from Cincinnati at the end of last season. It was reported last December that Lewis was expected to leave the team to pursue opportunities elsewhere, which included another head coaching job or perhaps a front office role. However, Lewis and the Bengals surprisingly reversed course, and the two sides came to terms on a two-year extension back in January. However, Ian Rapoport of NFL.com reports that the two-year extension was actually a one-year pact with a team option for 2019, so the club can move on from Lewis without penalty at the end of the season if it so chooses. Which means, as Rapoport notes, that Lewis’ future as the club’s head coach is once again in doubt. Lewis has guided the Bengals to a 130-118-3 mark during his tenure, and his club has qualified for the playoffs seven times (including five straight seasons from 2011-15). But Cincinnati is 0-7 in playoff games under Lewis’ watch, and the team now appears destined to miss the postseason for the third consecutive year. One of the reasons for the Bengals’ disappointing 2018 campaign is injuries. Lewis’ club has been ravaged by the injury bug — the Bengals have put more players on IR in 2018 than they did the last three years combined — and a number of key players who have avoided IR have nonetheless been sidelined for multiple games. So, as Paul Dehner Jr. of the Cincinnati Enquirer writes, owner Mike Brown will have to think about how much different the season would have been if the Bengals had not been hit so hard by injuries and determine Lewis’ fate based on that. We learned last week that current special assistant Hue Jackson could succeed Lewis as the Bengals’ head coach, and Rapoport confirms that report. RapSheet also suggests that Lewis could transition to a front office role with Cincinnati. As for quarterback Andy Dalton — who is now among those Bengals on IR — Rapoport says that the Red Rifle will be back with the team in 2019. Dehner writes in a separate piece that Dalton, who did have surgery to repair a torn ligament in his thumb, is expected to make a full recovery before the team’s offseason program begins next year. Dalton believes he has the full support of the team’s decision-makers, and Dehner agrees that no one is expecting the Bengals to part ways with the 31-year-old signal-caller (even though they could do so without taking on any dead money). Every year, the Fritz Pollard Alliance releases a list of recommended minority head coaching candidates. 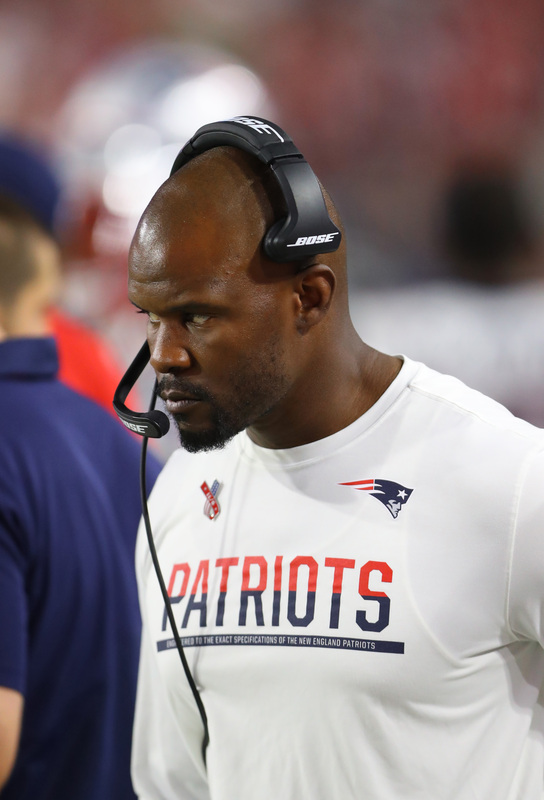 This year’s edition is nearly double in size and features the likes of Patriots linebackers coach Brian Flores and Cowboys defensive backs coach/defensive passing game coordinator Kris Richard, as Mike Jones of USA Today writes. Flores, the de facto defensive coordinator of the Patriots, figures to be a hot coaching candidate this year. The same goes for Bieniemy, who is helping to guide one of the league’s most dangerous offenses. Others on this list, such as Jackson and Austin, seem unlikely to garner real consideration for head coaching positions this offseason. The Browns turned the corner after dumping Jackson and appointing Gregg Williams as the team’s interim head coach, which isn’t a great endorsement for the offensive guru. Meanwhile, the Bengals hired Austin in January but fired him earlier this month as his defense was one of the lowest ranked in the NFL. Patriots offensive coordinator Josh McDaniels seemed to irreparably damage his future head coaching prospects with every team in the league except New England when he infamously jilted the Colts last offseason. But he has already been mentioned as a candidate for the Browns‘ head coaching job, and as Jason La Canfora of CBS Sports writes, there will be no shortage in interest in McDaniels when the head coaching carousel starts spinning in 2019. La Canfora does not specifically name any teams who are expected to pursue the 42-year-old, but his sources indicate that McDaniels will be under strong consideration despite the fiasco in Indianapolis. Speaking of the Browns, former Colts and Cardinals HC Bruce Arians recently said he would only consider becoming a head coach again if he were hired by Cleveland, but he walked those comments back shortly thereafter. However, Ian Rapoport of NFL.com says Arians was serious the first time and that he will contemplate returning to the sidelines if he can become the Browns’ head coach. Arians indicated that he will not consider overtures from any other clubs, but that if he does land the Cleveland gig, he would keep Freddie Kitchens as offensive coordinator and would consider keeping defensive coordinator Gregg Williams — currently the Browns’ interim HC — as well. It remains to be seen whether Arians’ interest in the Browns is mutual, but La Canfora reports that the team is expected to reach out to Iowa State coach Matt Campbell, who is very much on the NFL’s radar as a legitimate head coaching candidate. We have heard previously that Cleveland GM John Dorsey is a big fan of Campbell. Although the Jaguars are in the midst of a hugely disappointing season, Rapoport says that head coach Doug Marrone is not on the hot seat and is in no danger of losing his job at the moment (video link). Despite unceremonious ousters from Oakland and Cleveland, La Canfora writes that Hue Jackson could become a head coach again as soon as next year. Jackson is back in Cincinnati as special assistant to Bengals head coach Marvin Lewis, and if Lewis were to retire or transition to an upper-management position, JLC suggests that Jackson could take the reins. Team owner Mike Brown, who does things his own way, is a big fan of Jackson, and league sources say they would not be surprised if Brown goes that route. The Bears‘ defense is excelling in 2018, which means that Chicago defensive coordinator Vic Fangio will once again garner significant interest from teams looking for a new HC this offseason, per La Canfora. Fangio has interviewed previously for the head-coaching jobs in Chicago and San Francisco, and the Bears paid him very well to keep him aboard as Matt Nagy‘s DC when they hired Nagy to be their head coach earlier this year. There is a general bias against defensive-oriented coaches these days, but Fangio is regarded as one of the best defensive minds in the game and has a strong reputation for being able to connect with troubled players and to get the most out of his units. Lamar Jackson will likely start at least one more game for the Ravens, as Baltimore head coach John Harbaugh told reporters that Joe Flacco will be hard-pressed to return from injury in Week 12, per Jeff Zrebiec of The Athletic (Twitter link). Flacco has been dealing with a hip issue since Week 9, and while he’s not expected to require surgery, the veteran signal-caller did see a specialist in New York last week. Further complicating matters is Jackson’s performance in Sunday’s win over the Bengals, which vaulted Baltimore back into wild card contention. Jackson, the 32nd overall selection in this year’s draft, attempted only 19 passes against Cincinnati, but rushed 27 times for 117 yards in a 24-21 victory. Harbaugh and the rest of the Ravens’ decision-makers could opt to roll with Jackson as the club finishes out the season against the Raiders, Falcons, Chiefs, Buccaneers, Chargers, and Browns. Although he’ll undergo an MRI before getting any official diagnosis, Lions running back Kerryon Johnson isn’t believed to have torn his ACL on Sunday, tweets Ian Rapoport of NFL.com. Instead, Johnson is believed to have suffered a knee sprain. While a sprain wouldn’t knock Johnson out for the remainder of the season, it could put his availability for Week 12 in serious doubt. That’s especially true given that Detroit is facing a short turnaround, as they’ll face the Bears in a Thanksgiving Day matchup. Johnson has managed 5.4 yards per carry on 118 attempts so far during his rookie season, and also ranks seventh in Football Outsiders’ success rate, meaning he’s effective at keeping the Lions’ offense on schedule. If Johnson is out on Thursday, Detroit would use a committee of LeGarrette Blount, Theo Riddick, and Zach Zenner. The Bengals are paying former Browns head coach Hue Jackson $250K while he serves as a special assistant to head coach Marvin Lewis for the rest of the season, per Rapoport (Twitter link). However, Jackson had offset language in his contract with Cleveland, so Cincinnati will essentially get his services at no cost, while the Browns will see their bill lessened. Jackson is expected to focus on the defensive side of the ball in Cincinnati, and reports on Sunday indicated he could even take over defensive play-calling later this year. In case you missed it, the Bengals are expected to see the return of receiver A.J. Green in Week 12. Green suffered a toe injury against the Buccaneers in Week 8 and hasn’t played since.